While our home base was in Bruges, and we did spend a lot of time exploring that city, we also planned some day trips to other Belgian cities, using their awesome train and metro systems to get around. The first of these day trips was to Brussels, where we had a packed agenda. 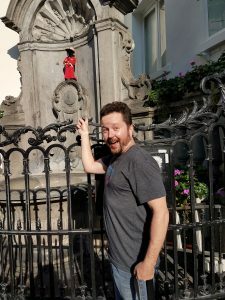 When you go to Brussels as a tourist, it’s pretty much mandatory to visit Belgium’s unofficial mascot: Manneken Pis, which translates to “Little man Pee”. Yep, it’s a tiny little statue of a boy urinating into a fountain. The people of Brussels love him so much that they dress him up in costumes that change several times a week, and every single shop in town sells miniature versions of him (I bought one that’s a wine bottle pourer – guess where the wine comes out of?!). Honestly, the statue is underwhelming in person, but it’s only a short walk from both Brussels Central and the Grand Place, so there’s no good reason not to take a quick look and then move on. Belgium’s unofficial mascot: Manneken Pis. Other stops in the city included a stroll through the Galeries Royales Saint-Hubert, a fancy shopping arcade filled with boutique chocolatiers, pleasant cafes, and luxury clothing stores selling stuff I neither wanted nor could afford. Next up was a jaunt down the Rue des Bouchers, Brussels’ Restaurant Row. I was advised not to eat at any of the restaurants there because they’re supposedly all overpriced tourist traps, and the cajoling, begging, carnival barker-esque greeters standing outside of each restaurant seemed to confirm this. Finally, we took a quick look at the Grand Place, which is the largest city square in Belgium and is home to a Hard Rock Café. Of course. In all seriousness, while it is very touristy, most of its buildings are lavishly adorned with gold and the whole thing is quite impressive. After all of that, I was ready for a beer or four, and luckily there’s no shortage of amazing beer bars and breweries in Brussels. Since we were in a bit of a time crunch, we only hit two, starting with Delirium Café, a three-story dive bar that holds the Guinness World Record for World’s Biggest Beer Selection (3,162 different beers as of February 2018). And right across the entrance from Delirium is none other than Jeanneke Pis, Manneken’s less famous (but in my opinion, more charming) peeing sister! From there it was over to Moeder Lambic, which specializes in obscure Belgian sours, lambics, and other funky brews, 40 of which are on draft. Leonard Kinsey at the Atomium in Brussels, Belgium. My mom had an ultra-sour beer that she didn’t enjoy at all, and for some reason Monika was turned off by the delicious crunchy roasted malt they serve as a snack. But I found the place utterly charming, and was impressed with the knowledgeable staff and well-curated draft list. However, the biggest draw of Brussels for me was the site of the 1958 World’s Fair and its massive triumph of futuristic architecture: The Atomium. It’s a 335-foot tall structure in the shape of an atomic iron crystal, magnified 165 billion times! The “atoms” contain a permanent exhibition showing the history of the fair, as well as some temporary exhibitions which are navigated via a tubular system of stairs, escalators, and an elevator. Getting there is easy: from the Central Station it’s about a 20 minute metro ride to Heysel/Heizel station, and then a quick walk past Bruparck, home of the Oceade water park and the Mini-Europe miniature theme park. Admission to the Atomium is 15 Euro, which isn’t bad at all. However, they kind of corral you into a line for the elevator that goes to the very top of the structure. Depending on the wait time for this (it was about 45 minutes for us), you might want to skip it. While it does offer some impressive vistas and access to the (expensive) restaurant and bar, there are equally impressive lookout points throughout the exhibition tour. 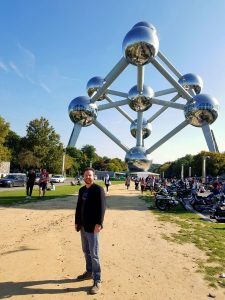 I very much enjoyed the Atomium, and would recommend a visit to anyone interested in World’s Fairs, futurism, architecture, themed environments, or science and technology. And in my opinion, the sci-fi light show during the final escalator ride down to the gift shop is worth the price of admission alone!